Energy bills can be tricky to understand but contain a goldmine of information. However, once you have a good understanding, it can be used to help you save in the future. In this article, we explain more about how your bills is formatted and how to understand the various sections. If you’re currently in a window to switch to a better deal. As a business owner, your primary concern be interested in your costs, and how much you’re getting charged. In the following British Gas example, we’ve outlined the standard costs that you can find on your business energy bill and how they mean for your monthly outgoings. If you’re with another supplier, your bill may be laid out slightly differently. It’s worth noting that failing to pay your business energy bills will impact on your business's credit rating which could limit the energy deals you are eligible for in the future. Click here for more information. 1) Outstanding balance from previous bills This figure indicates if you have any outstanding balance from previous bills. Often, this will be dependent on the time of year. If you set up a direct debit in the warmer summer months – when energy consumption levels will be lower – you may find that you are not paying enough to cover your energy consumption in the winter. For more information on the charges listed above, visit our guide to tariffs and contracts page. 3) Total amount owed This is the most noticeable part of a business energy bill. It indicates how much you must pay in total, including your previous balance, charges from the current month, as well as VAT. 4) Breakdown of charges For a more detailed view of how your charges are calculated, your supplier should provide a detailed breakdown on your bill. As an example, consider a multi-rate contract where cheaper rates are offered during off-peak hours. In this instance the breakdown will show how your usage is divided between the two different rates. If you find that you use very little energy during the cheaper off-peak hours, then perhaps there’s a better type of business energy contract suited to your business. 5) Billing period This is the period that you are being billed for and spans from the date that your last bill was sent, to a few days prior to you receiving your current bill. If you’re unhappy with the current length of your billing period, it may be possible to contact your supplier to have it changed. However, billing periods are normally based on either a monthly or quarterly period. 6) Account number Your account number is usually located somewhere near the top of your bill, and is used by your supplier to identify you as a customer. It’s handy to have your it readily available as you’ll need it when contacting your supplier directly. 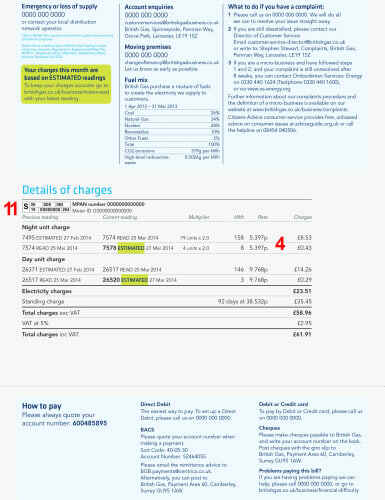 7) Contact details If you wish to query any aspect of your account, you can find contact details on your bill. Most suppliers will also include separate contact details depending on your query type. For example, if you wanted to inform your supplier that you’re moving premises, a separate contact number should be listed on the bill. 8) Contract information Somewhere on your bill, your supplier should indicate the details of your current contract. This includes: * The name of the plan that you’re on * When it is due to renew * A contact number to discuss your plan. Your supplier should write to you at least 60-120 days’ prior to your end date to let you know that your contract is ending. However, it’s always good to keep this date in mind so you have time to properly research the market and carry out a thorough comparison. If you’re short on time, our energy experts can help, and take away the hassle of searching the market by doing it for you. They will compare the best deals from our trusted suppliers. Click to find out more. 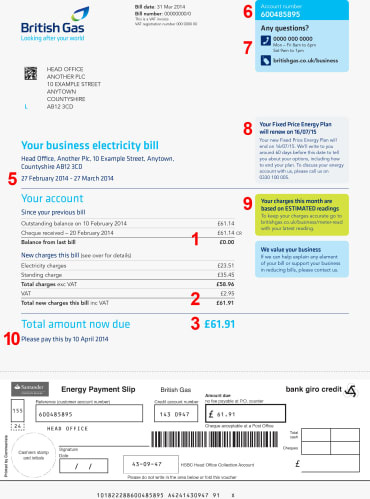 9) Your reading type Your bill can be based on two different types of reading: * Estimated readings – Used if a customer hasn’t provided their supplier with a meter reading in some time. * Actual readings – More accurate, and based off a recent meter reading. It’s worth noting that estimated charges can leave you paying too much, or not enough, for the energy that you’re using. It’s recommended that you provide your supplier with actual meter readings at least once every six months. 10) The pay-by date You can usually find will find the date by which the bill needs to be paid underneath the breakdown of costs. If you fail to make a payment by this date, then your supplier may add on a late payment fee. Keep in mind, paying your business energy bill by cheque, or post, requires additional time, so you should keep this in mind when paying using these methods. 11) MPAN or MPRN number An MPRN or MPAN number is used by the supplier to quickly and easily identify your property. This can usually be found on your bill and should match the MPAN or MPRN printed on your meter. If this is not the case, then you should contact your supplier immediately. What costs are included on my business gas and electricity bills? The two main costs that make up your business gas and electricity rates are: * A daily standing charge - This covers the cost incurred by the supplier to supply energy direct to your premises, as well as upkeep costs for the national grid. * A charge per unit of energy (kWh)- This is a charge that covers each unit of electricity or gas that your business uses. It’s defined within the wording of your contract. These are the two costs that you will control any price comparison quotes you get. They can be broken down even further, and doing so can help you better understand how they can impact your overall business energy costs. Wholesale costs - Part of your unit rate, this cost is not paid by you directly, instead it refers to the amount that business energy suppliers will pay to acquire the energy that you use. It’s worth keeping in mind that increases in cost on the wholesale market are traditionally passed on to customers and these increases are usually reflected through your cost per unit. Transmission use of system charges (TNUoS)- - Your TNUoS charge covers the supplier’s expense for maintaining the national grid, which is used to transport energy to your premises. Generally encompassed by your standing charge, the cost of your TNUoS can vary depending on your business’s geographical location. Paying for distribution use of system (DUoS) - This charge covers the costs incurred by your Distribution Network Operator (DNO) – a company licensed to distribute electricity in your area – and includes day and night charges, as well as maximum supply requirements for larger businesses. Climate Change Levy (CCL) - The Climate Change Levy is a government imposed tax on each unit of energy that commercial customers consume. The levy is designed to encourage businesses to improve their energy efficiency and reduce their carbon footprint. It is possible to become exempt from the CCL – however this is subject to the level of action you have taken to improve your energy efficiency. VAT - VAT is added onto your business energy bill by your supplier. VAT is usually charged at 20%, but it is possible to reduce this figure to as little as 5% of your business energy costs if you use less than 33kWh of electricity or 145kWh of gas per day. Find out more about reducing the VAT on your energy bills. The method of payment that you choose can impact on the overall cost of your bill – depending on your supplier – so, it’s worth taking the time to consider how you pay for your energy. Direct Debit Direct debit is the most common method of payment for business energy customers as it’s not only the most convenient, but some suppliers will also offer a discount for paying this way. If you pay by a fixed direct debit, it’s important to keep an eye on how much energy you are using. It may not cover the extra energy that your business may use throughout the colder winter months. It’s recommended that you review your direct debit amount at least once a year to ensure that it is still sufficient to cover your energy usage – failing to do so can leave your account in credit, or debt. BACS Some business owners prefer BACS payments instead of a fixed direct debit as it allows them to change the amount they pay month-to-month based on how much energy they have used. It means you’ll have to action each time you need to pay your business energy bill, which can be time consuming – but also gives you greater control over your outgoings. Debit or Credit card Many suppliers offer the option to pay via credit, or debit card. To do so you will need to contact your supplier’s payment department directly. This number can usually be found on your bill. Much like BACS, paying by this method means you must contact your supplier each time you wish to make a payment, which is not ideal for a busy business owner. Cheques or Giro Another option is to pay by cheque or Giro slip – which can be found at the bottom of your business energy bill. These need to be sent via the post to an address that is defined on your bill. It’s important to take into account postage – typically 3-5 days prior to the final payment date – to avoid incurring late charges. Picking the right payment method for you can be as much about keeping costs down as it is about convenience that certain methods can offer busy business owners. If you feel another method of payment may suit your business needs better, you should contact your supplier. What is an average business energy bill? Bills are ultimately dictated by your unit rate, and your energy usage and as every business is unique, usage varies dramatically, average usage is hard to determine. The best way to find out whether you’re paying over the odds is to look at the unit rates available to businesses of your size. For figures on average prices and bills, click here. Why is my business energy bill so high? The prices offered in a quote for business energy are known as acquisition rates, generally offered to new customers. These prices tend to be more favourable to encourage people to become customers. If you haven’t switched suppliers in a while, it’s likely you’re paying more expensive rates, and could benefit from a new customer deal. The following are the primary cause of inflated energy bills: * Deemed rates: If you’ve recently moved into a new business premises but didn’t sign up with an energy supplier, the supplier that provided energy to the previous occupant will most likely continue to supply the premises. As a result, you’ll usually be place on “deemed” rates, which are considerably more expensive than the rates would be offered to a new customer. Deemed rates are priced this way to make up for the financial risk suppliers take when they supply energy to a customer who they know little about –they have no record of their credit history or what the business does. Out of contract rates: If your contract has recently expired, but you did not arrange a new contract, your supplier will automatically put you on out of contract (also known as standard) rates, which tend to be more expensive than contractual rates. In such cases you will have the opportunity to switch to a better deal – typically after a 30 day notice period. Run an energy comparison to see if you could save. The government’s Feed-In Tariffs (FITs) and Renewable Heat Incentive (RHI) schemes applies to businesses and households that install renewable or low carbon technologies at their property. The FIT scheme is dedicated to electricity-generating technologies while the RHI scheme is dedicated to heat-generating technologies. With the FIT scheme, your chosen FIT Licensee will pay you for the electricity you generate, and you can also sell back any excess electricity to the National Grid, using this income to offset charges on your electricity bill. With the RHI scheme, the government will provide a fixed subsidy payable over twenty years provided you have installed renewable technologies eligible under the scheme.